Because there is no one to one correlation between a phone number and a particular Phone Word, there is no priority given based on a phone number spelling a particular business name. As such, a phone number that spells a particular business name will also spell many other things including company names, brand names, generic words, and word combinations. There are 3 to 4 letters on each number key on your telephone keypad. 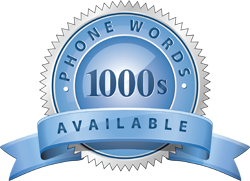 This means that every Phone Word will translate from 729 to 4096 different word combinations. National Dial A Word Registry license and sell telephone numbers only, irrespective of what the numbers translate to. It is the responsibility of the company with the rights/enhanced rights to the Phone Word on how it is displayed/advertised.